Online Logical Thinking Puzzles for kids can be found here: http://www.edhelper.com/logic_puzzles.htm . You can also print logical thinking puzzles there as well. This site, http://www.aimsedu.org/PUZZLE/categories/logical.html is cumbersome to navigate, but has some nice puzzles and riddles also worksheets to print out available for free. The Philosophers’ Club by Christopher Phillips is an an introduction to Socratic thought and filled with fun games and riddles another good one, Philosophy for Kids : 40 Fun Questions That Help You Wonder … About Everything! Wow- I LOVE this site! If you are a board game addict as I am- you will ADORE it! If you or your kids have any affinity for board games- take a look. the blog, Yehuda Gaming and Blogging is entirely devoted to board games. It does not disappoint. Posts on top 10 board games ( an bet you haven’t heard of most of them- and will want to rush and and But most ! )how to rejuvenate old games gone stale, playing board games with your kids. The writing in the site is top notch- clever, insightful , honest and funny. The owner is Yehuda Berlinger , a game designer and Internet professional. Well worth the look! This game can be hard to find- but it is worth the effort- You can also buy online at a pretty good price ( I paid 25.00 for mine!) 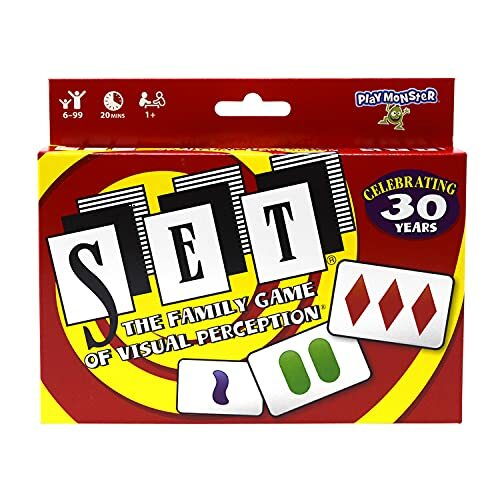 from Amazon.com-here: SET Game . It is one of those games where you can sit and play in a relaxed many over a cup of hot chocolate and play game will you talk with your child or children. It takes a lot of brain power so things tend to get quiet- the perfect time for a mother and daughter to get reconnected or spend quality time with your kids. It is a matching game of sort- you create SETS based on colour, shapes, shading and numbers. I would say good for around ages 6 t0 adult. It is also one of those games that I find just as fun and interesting to play as other children do. You can try playing SET online , where it is called “Match” but its exactly the same game as SET. I am in danger of needing to make Settlers of Catan its own category on the site. Yikes- sorry about the rash of posts lately. Please check out Robber Free Realm which is a blog devoted to playing Settlers of Catan. There are basic instructions on how to play as well as in depth strategy on every aspect of the game. ( Remind me NEVER to play this guy!) . Even an experienced Settlers of Catan player will get something out of this site- well worth the visit.